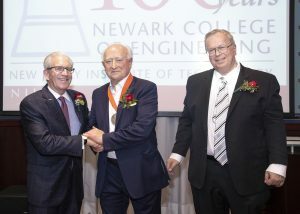 Congratulations to Yuriy Tarnawsky on his achievements and induction into New Jersey Institute of Technology’s NCE 100 Hall of Fame. It is a privilege to have you as a member of the Ukrainian Institute of America. Yuriy Tarnawsky, who graduated with a degree in Electrical Engineering from Newark College of Engineering in 1956 and a PhD in Linguistics from NYU in 1982 is a writer and linguist who is also former electronics engineer and computer scientist for IBM Corporation. Tarnawsky is one of the founding members of the New York Group, a Ukrainian émigré avant-garde group of writers, and co-founder and co-editor of the journal New Poetry, as well as member of Fiction Collective, a collaborative of innovative US writers. He has authored more than three dozen books of fiction, poetry, plays, translations and criticism in both Ukrainian and English. His works have been translated into nearly a dozen languages.